Cara Delevingne has made the name for herself not only in the fashion industry but in Hollywood film industry as well. After appearing in Suicide Squad and Paper Towns, the famous model has established herself as a successful actress. The 24-years-old, Cara Delevinge may still be a bit of a newbie as an actress, she seems to be pretty well-versed in the dating world. From a member of the royal family to one of her BFF’s mega-famous exes, let’s just say the supermodel-turned actress has been pretty lucky in the love game. From Leonardo DiCaprio to Selena Gomez, Delevingne has been tied to every of her celeb friend that she's gotten dinner with. Most of the rumors are simply that, rumors. However, some of those rumors have happened to be genuine. So, let's dive into Delevingne's relationships and find out who is she currently dating. Delevingne’s first high-profile relationship was with musician Jake Bugg. The young couple started dating in 2011 and dated until 2012. The two seemed to be a good match for one another and they were frequently spotted at several events together. Unfortunately, Delevingne’s star and all of the attention that came with that became a lot for Bug to handle. They called it quits after the stresses of fame became too much for their relationship to overcome. Delevingne was rumored to be dating the One Direction singer, specifically after they caught during an event by “The Book of Mormon” together in London’s West End. The pair was friendly with each other even before their rumored 2013 courtship. Harry Styles went to numerous runway shows that featured Delevingne and many thought that he attended to support his girlfriend. Regardless, the two seemed fond of each other. 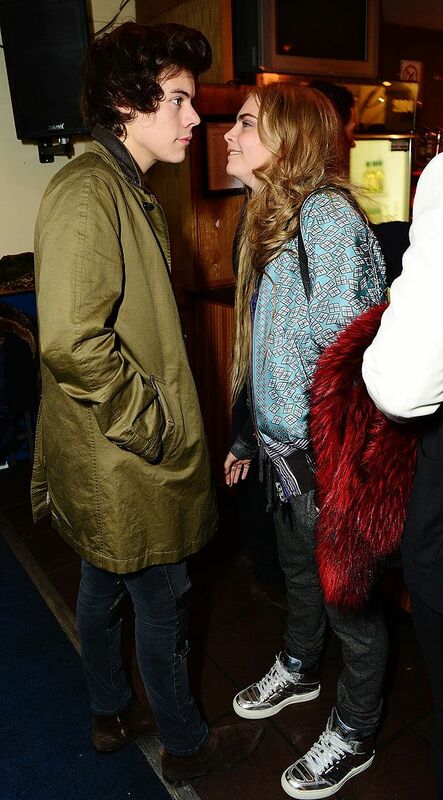 But Styles and Delevigne didn’t stay together for long. Also Read: One Direction's Harry Styles to confirm the beautiful Kendall Jenner as his girlfriend!! In 2014, the relationship between Delevingne and the “Fast and the Furious” actress was a major focus of tabloids. The pair, who had an age difference of 14 years, moved quickly, even going on a hot and heavy vacation together in Mexico before things eventually fizzled out almost as quickly as they started. Apart from all this relationship, there are some honorable names whom Delevingne has been rumored with i.e. Selena Gomez. After vacationing in the French Riviera together back in 2014, rumors sprung that the “It Ain’t Me” singer and model were engaged in a romance. Gomez later squashed the rumor, though she did admit that she “loved” hearing it. Besides, she was also conjectured to be in a romantic relationship with several other renowned personalities. Let's learn about them all. Also in 2014, Delevingne was rumored dating her “Tulip Fever” co-star Jack O’Connell, after she shared a cheeky Instagram post of him sporting what looked like hickeys on his neck. The romance was later confirmed, but also quickly fizzled. Delevingne exchanged flirty texts with the “Geordie Shore” star, Gaz Beadle in 2013, but an actual romance was never confirmed. Well, you might be wondering about all the baseless rumors that Delevingne had been with. But it's the obvious reason for any celebrity to be in the spotlight for any of the relationships. Delevingne is such a name who usually comes into the highlight for her hook up with high profile celebrity. Now, let's find out whom she actually dated. Delevingne’s latest relationship has been with singer St. Vincent (whose legal name is Annie Clark). They started dating in early 2015 and have been going strong ever since. Before the September split and current wonder over their potential reconciliation, Delevingne and the singer, Vincent, dated for almost two years, and were even rumored to have gotten engaged more than once. “I’m completely in love… Before, I didn’t know what love was, real love. Uh! those are the cutest thing for someone who is in a relationship. Here’s hoping that Delevingne has really found her true happiness and they can go the distance. For all the fans of Cara Delevingne, what do you think guys? Stay tuned to Frostsnow for more information on your favorite celebs!